Zootopia is an animated masterpiece. It is a completely unexpected stroke of brilliance and artistry. On par with the best films that Disney has ever made. That statement is not conjecture or hyperbole. Zootopia is simply that good. I was dumbfounded walking out of the theater. Who would have guessed that the tale of a CGI rabbit is arguably the best film of 2016 so far? Certainly not me. Zootopia is a cinematic surprise in every sense. It is wildly adventurous, knockdown funny, and delivers a message of tolerance that every child will understand. Zootopia takes place in a world where animals live side by side in peace. Prey and predators have long abandoned their instincts. Harmony exists as creatures great and small go about their business without fuss. But underlying this utopian paradise are long-held stereotypes that prevent upward mobility. We meet the precocious rabbit, Judy Hopps (Ginnifer Goodwin), as a child in Bunny Burrow. Her dream is to become the first rabbit police officer in the great city of Zootopia. Everyone, including her two hundred and seventy-five siblings, think she's nuts. Only the big and strong animals, like lions, tigers, buffalos, elephants, and hippos, have positions as law enforcement. Determined to prove the doubters wrong, Judy becomes the first bunny to graduate from the police academy. Even Mayor Lionheart (J.K. Simmons) congratulates her for outstanding achievement. Judy's exuberance fades quickly. Police Chief Bogo (Idris Elba) puts her on meter maid duty. She's too small and weak for real police work. While writing tickets, Judy has a run in with a slick con artist fox, Nick Wilde (Jason Bateman). She's furious at his scams, but realizes that he may be an invaluable ally in searching the underworld of Zootopia. Fourteen predator animals have mysteriously disappeared. The city is terrified by the abductions. The mayor and police chief struggle to find any clues. Judy decides to prove her worth by finding the missing animals. Leading to a shocking discovery that threatens the very existence of Zootopia. The script by Jared Bush and Phil Johnston is richly imaginative. They break down Zootopia into different sections, depending on the type of environment an animal needs to survive. The city has a tundra, rainforest, arctic, and tiny little subdivisions for the smallest critters, like vols and mice. As Judy and Nick explore the vast Zootopia, they have hilarious interactions. These are all quite humorous, but one meeting in particular, with the crime boss of Zootopia, will have you falling out of your chair laughing. The dialogue and the situations the characters face are so well written. Zootopia's screenwriters deserve every accolade possible for their creativity. Zootopia isn't all fun and laughs. The film realistically depicts violence. This is where the filmmakers really strike a nerve. Animals get hurt, scarred, are vulnerable. Judy learns this lesson the hard way in a jarring early scene. It prepares the audience for a touch of realism in the fantasy world. Our heroes are not invincible. They face tremendous risk when engaging the bad guys. Judy is consistently underestimated because of her size and species, but those looking out for her have a valid point. Being a police officer can get you killed. Bravo to Disney and the filmmakers for not sugarcoating danger. At the heart of Zootopia are lessons about prejudice and equality. Don't judge an animal because of what you think they should be. Every animal has a right to pursue their dreams. It seems hokey, like an after school special, but it's not. These messages are taught via stealth not sledgehammer. Judy and Nick's search for the truth turns them inward. They discover uncomfortable truths about themselves on the journey. Again, the writing here is so damn good. I truly believe that every child leaving Zootopia will be a better person having seen it. Zootopia is superior to Inside Out and Frozen. 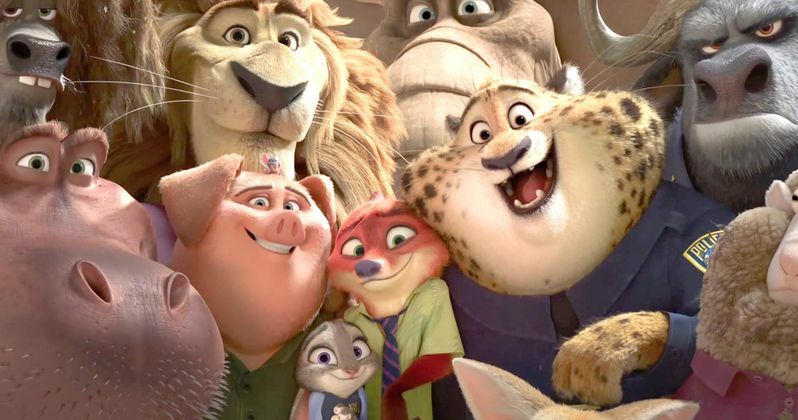 It's hard to imagine that Zootopia could surpass those colossal hits, but it deserves to. There's no silly music, manufactured melodrama, or superfluous dialogue. Zootopia is a high concept, ingeniously written work of art from Hollywood's storied animation studio. Disney should have released this film during the summer to great fanfare. I worry that it'll get lost opening in March. That would be a crime. Zootopia needs to be seen by everyone.